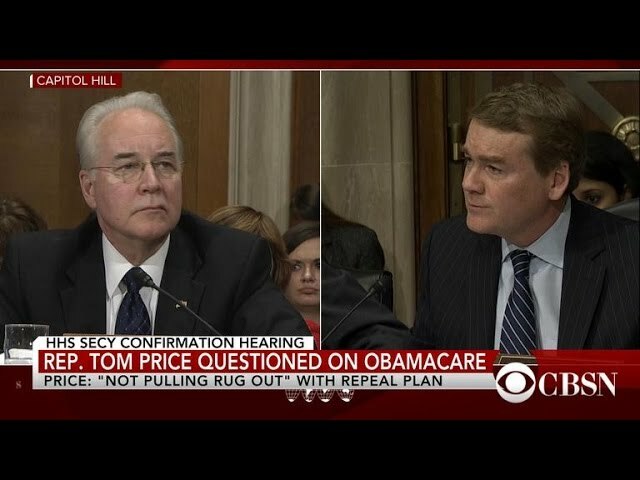 Michael Bennet went after Trump's HHS pick with Rand Paul's line on the federal debt - Denverite, the Denver site! Jan. 18, 2017, 4:22 p.m.
Rep. Tom Price of Georgia is an orthopedic surgeon, as well as a member of the Tea Party caucus and a staunch opponent of the Affordable Care Act. He’s also President-elect Donald Trump’s nominee for Health and Human Services. “I’ve never shown my knee to any nominee before,” Bennet said before switching gears. Much of the questioning of Price Wednesday focused on his stake in an Australian company that makes experimental drugs at the same time he helped draft legislation that makes it easier for new drugs to get approval from the Food and Drug Administration, as well as on his positions on repealing and replacing the Affordable Care Act. Sen. Michael Bennet, a Colorado Democrat, pushed hard on a different line of attack that borrowed generously — with attribution — from Republican Sen. Rand Paul, the only Republican to vote against the budget resolution that includes the repeal of the Affordable Care Act. Paul voted no because the resolution allows for more than $9 trillion in new debt over the next 10 years. During hearings before the Senate Committee on Health, Education, Labor and Pensions, Bennet quoted Paul at length to say that Republicans were tramping on principles of fiscal conservatism in their rush to repeal Obamacare. He asked Price if he would promise not to increase the debt or the deficit in the process of getting rid of the outgoing president’s signature legislation. So, Bennet asked Price, how does he square his budget hawk position with this vehicle for repealing the ACA? Does he support this budget? “What I support is an opportunity to use reconciliation to address the real challenges in the Affordable Care Act and to make certain we put in place at the same time a provision that allows us to move the health care system in a much better direction,” Price said. Do you support the budget that was passed by the Senate Republicans? Bennet pressed. “I support the process that allows for and provides for the fiscal year ’17 reconciliation bill to come forward,” Price said. “Will you commit as a member of the Tea Party that no replacement for this dreadful Obamacare that allegedly created this deficit and debt won’t contribute to the deficit and debt?” Bennet asked. Price said he could commit to working with Democrats to reduce the deficit. Oh, and on Bennet’s painful knee, Price recommends an MRI.